OK, I know most of you love that jellied cranberry sauce right out of the can with the ridges still on it, but sometimes there really is something more delicious you can at least try. 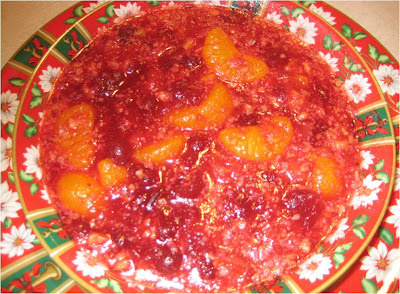 For many years, my mother-in-law experimented with new cranberry recipes – relishes, citrus dishes with cranberries that were way too orangey etc. etc. A number of years ago she served a wonderful cranberry/fruit mixture and I have been making it ever since. Just having made it recently for Thanksgiving, I thought I would share it with you so you could give it a try at your next holiday dinner. Dissolve jello in water/juice mixture. Add oranges, pineapple, cranberry sauce and nuts. You can pour this into a pretty holiday mold if you have one or just pour it into a serving bowl. Refrigerate until set, about 2 hours. This is not a thick jello, but just a nice, smooth salad. My mom loves this so much, she will make a recipe and enjoy it for days. And we all know how picky she is! Merry Christmas. Hey Becky, that sounds delicious, but why it's called a salad I will never understand. 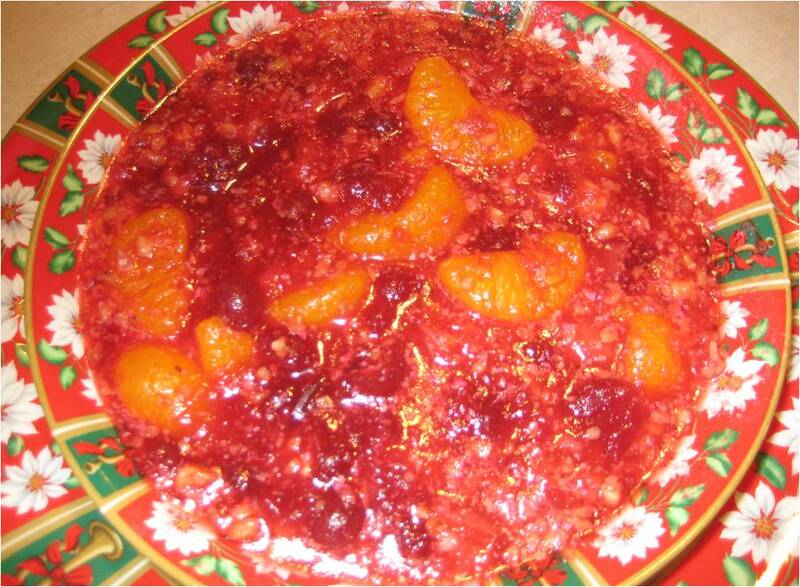 I read somewhere that you can use leftover cranberry sauce and turn it into a simple dessert. You take any leftover pie crust scraps/ a puie crust and cut pieces into small suares. Place some cranberry sauce inside,wrap them up and freeze so the shape stays. Then brush with egg wash and sprinkle some sugar on top and bake at 350 until golden brown, and I assume bubbly. It sounds simple enough for me to try one day. Hmmm...interesting Jen! I bet that is good. Give it a try and let me know how it goes. And you're right, who knows why it is called a salad.